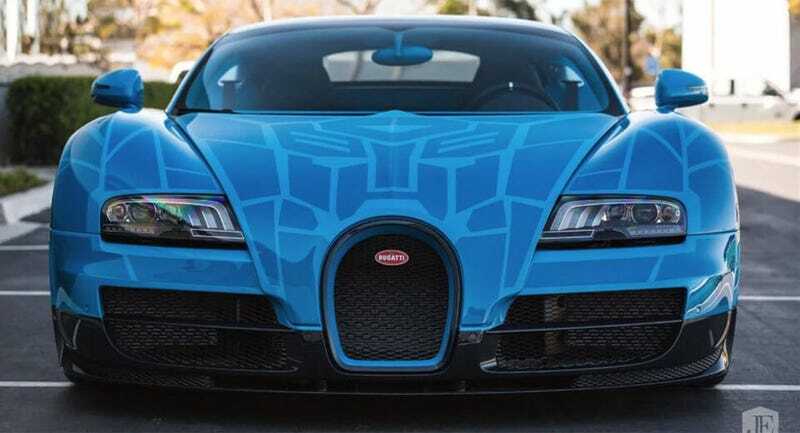 What Kind Of Wealthy Nutjob Paints Their Bugatti In A Transformers Theme? You may remember a time when Xzibit would put your Transformer into your Transformer. But imagine someone actually putting a Transformer into a 2014 Bugatti Veyron—or at least painting it like one—and asking almost $2 million for it. Currently for sale at California luxury car dealership iLusso, which claims to be a “leader in hypercar inventory,” this 2014 Bugatti Veyron Grand Sport Vitesse sports the classic light blue and black paint scheme that is iconic to the brand. But look a little closer at the graphics and there is more than meets the eye. According to Carscoops, this very car was for sale a few months ago for a mere $2.1 million, but it seems that it is quite difficult to find a buyer who fancies both Bugattis and childhood toys, since the price has now been lowered to a more reasonable $1,899,000. That’s still a lot of money for some Autobots livery and a car that doesn’t actually transform!